The packaging of So Hollywood is sturdy, in a black case with the Anastasia Beverly Hills logo in its distinctive rose gold. The highlighter itself is a beautiful true gold colour with a mosaic embossed design that is oh so pretty and I really don't want it to disappear! The first thing that I noticed when I swatched this product is that it is both very pigmented and buttery. This means that you need to use a very light hand and very little product to achieve a golden glowing highlight. 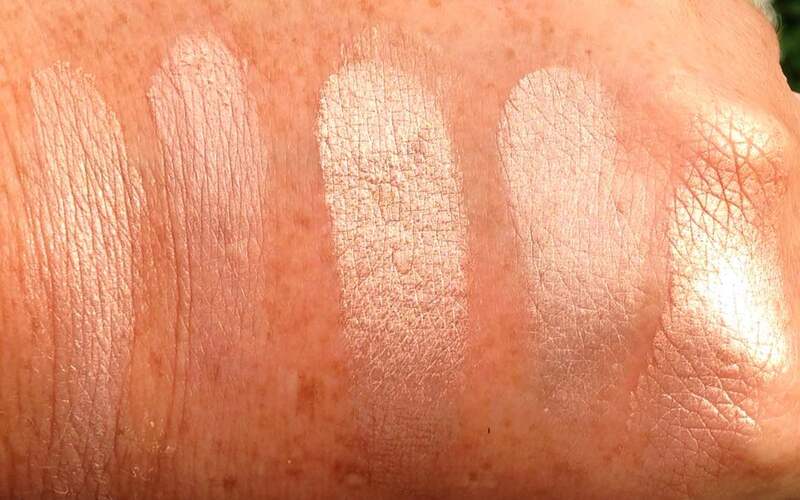 I started this post by saying that I didn't need another highlighter, but as you can see in the swatches above, it is much more golden than any of my other highlighters so I think it has a place in my collection. In the photo, it is the middle swatch and they others are: (left to right) 1. Charlotte Tilbury Filmstar Bronze & Glow, 2. Kevyn Aucoin The Celestial Powder in Candlelight, 3. Anastasia Beverly Hills Illuminator in So Hollywood, 4. theBalm Mary Lou-Manizer and 5. BECCA X Jaclyn Hill Champagne Pop. I have used So Hollywood a few times already and it looks best with tanned (real or fake) skin and, on me, a bronze/golden smoky eye or with MAC Golden Olive pigment. I think it makes me look healthier than I actually am (always the goal so, result!) and I am really loving the glow and highlight it adds to my face. I use it on the tops of my cheekbones, on my cupids bow, as an inner eye highlight, a small bit on my nose and on my brow bone. I am delighted that I took the plunge and bought this beautiful product. At £28, it certainly isn't the cheapest highlighting product but with 9g of product, I don't know if I will ever hit pan on it! Are you tempted to try any of the Anastasia Beverly Hill Illuminators? What is your favourite highlighter? I'd love to hear in the comments below!